Mr. Sun: My question is about Binion's $1 million display. I have run across conflicting accounts that I'm hoping you can straighten out. Some sources state that the display first appeared at the Horseshoe in downtown Vegas in 1964. Other sources say it first appeared in the 1950s in a different club and moved to the Horseshoe in 1964. The collection of 100 $10,000 gold certificates, encased in plastic and on public display, was first unveiled Dec. 11, 1954, at the newly remodeled Joe W. Brown Horseshoe Club. The moment was captured in a photograph that appeared on the front page of the following morning's Review-Journal. The caption noted the display was "another first" for Las Vegas. With that $1 million display, Brown, a soft-spoken Southerner credited with Fremont Street's transformation into Glitter Gulch, created the Mirage volcano of its era. The display and its successor would for decades be the city's most popular attraction � an estimated 5 million tourists snapped photos in front of the bills. But inflation, the decline of downtown and the rise of casino-front attractions on the Strip took their toll. The confusion over the date of the display's unveiling likely arises because Brown, who had purchased the Horseshoe from Benny Binion in 1953, sold his $1 million display in 1959. 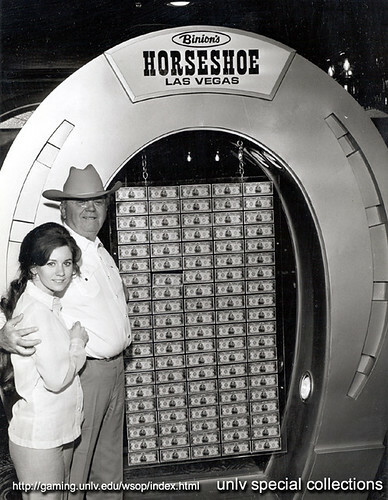 In 1964 Benny Binion, who had by then bought back the Horseshoe from Brown, re-created the attraction with another collection of $10,000 bills. Two unveiling dates. Two owners. Same casino. million dollar display with his daughter Becky. It was Binion's collection of bills that his daughter Becky Behnen sold in 2000 to Kansas City coin collector Jay Parrino. The Treasury Department stopped distributing $10,000 bills, which featured former U.S. Supreme Court Justice Salmon Chase, in 1969. By 2000 only 340 remained in circulation, making the display the most valuable currency collection in the world, according to experts. When the current owners of the casino, now known as Binion's, decided last year to evoke the property's history by creating a new $1 million display, they assembled $270,000 in $100 bills, $688,000 in $20 bills and $42,000 in $1 bills. The owners estimated replicating the original display by gathering $1 million worth of the $10,000 bills would have cost $16 million.